As regular readers know, I’m a big fan of Malwarebytes. It’s simply the best I’ve found when it comes to removing the baddies with the least amount of pain, suffering, and no perceivable performance hit when it’s keeping my puter safe. Now, the big ones here are faster scan speeds, no more reboots to remove malware unless it’s totally necessary, and the new user interface. Scan speeds: They say 4X faster. A full scan of my puter used to take 12-13 minutes. Now it takes 4 minutes. So, I’m seeing 3X faster. Still, that’s WAAAAY faster. Thumbs up! New UI: Yup, the new user interface is simpler, more intuitive, and more sensible. All the settings are now on one “screen”, with tabs for different groups of settings. Pretty nice. Well, theoretically, you should get it automagically. As I said, I have the paid version, and I still haven’t gotten an upgrade notification. I’m an existing subscriber of Malwarebytes Anti-Malware. How much do I have to pay? You don’t have to pay anything extra. 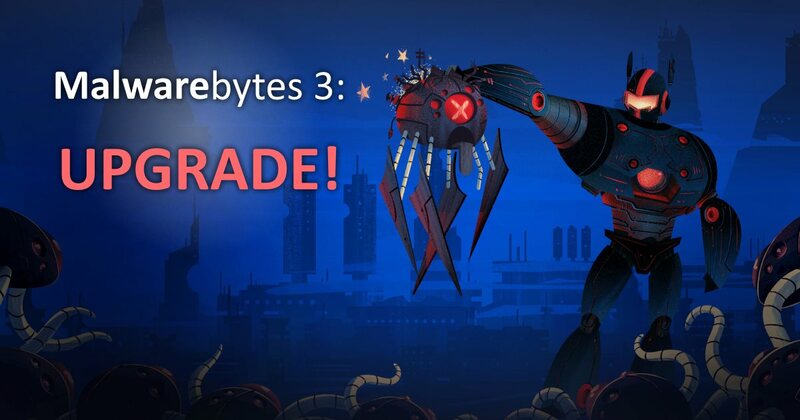 Even though Malwarebytes 3.0 sells for $39.99, we are grandfathering ALL our existing customers at their original price. So if your subscription is currently $24.95, that is the price it will remain at, and you can get Malwarebytes 3.0 without having to pay anything extra. Your existing license key will work automatically with Malwarebytes 3.0. I have a Malwarebytes Anti-Malware lifetime license. Will it work for Malwarebytes 3.0? Yes! 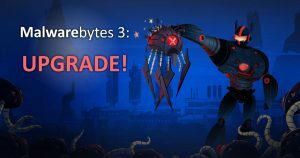 Simply install Malwarebytes 3.0 on top of your Malwarebytes Anti-Malware and your lifetime license will automatically apply to Malwarebytes 3.0. So, I just went to the Malwarebytes.com homepage, and clicked the Free Download button. Then, I ran the installer. DONE! It recognized my lifetime license and everything – didn’t even need to reboot! It also kept all my settings exactly the same, so it’s really a no-brainer: Download, install, carry on. If we use that Malwarebytes 3, do we have to use also an anti-virus like AVG or any other one? Malwarebytes says that now you don’t need to, but I’m just using Windows Defender anyway – which is built-in to Win 8 and Win 10. But Malwarebytes will still play nicely with most antivirus software that you might already have, just like v2 did. If you think windows defender is good then you are ignorant. Windows defender has NEVER been any good and that goes for Microsoft security essentials as well. They are junk! I have been using Windows since 3.11 and Defender has NEVER stopped malware. You need to get tracked and use google to see how bad Microsoft Defender is. Oh ya,,You are also ignorant for using ant Windows past Windows 7. The new, so called Windows, is nothing more than a huge tracking mechanism that is very hard to stop, unless you really know what you are doing. It’s true that Defender is not the greatest antivirus out there, but it’s also free and built-in to Windows these days. That’s better than nothing for the vast majority of people. Based on various comparison tests I’ve read, yes, Defender is pretty bad compared to other products, but it does still catch a lot of stuff (it has for me, anyway). However, it’s not quite good enough, which is why I recommend people also use Malwarebytes. As far as Windows 8 and 10 and spying, that has always been happening with M$ and will continue on into the foreseeable future. It is nevertheless rather trivial to turn off a lot of the most blatant “spying mechanisms”. Even then, naturally there are still other entry points, but that’s no different than Win 7. You can use network monitoring tools and see for yourself how often Windows is “phoning home”. IMO, Windows is the least of my worries. When the NSA and CIA can spy on literally ALL internet traffic and track everything I do, and if I’m sharing my entire life on Facebook, and if I’m signing in to every site out there with my FB account, and if I’m storing all my data in the cloud, who cares about Windows? Of course, I care. But the point is that focusing on one element of online security still leaves you wide open because you can easily miss the forest for the trees. Never stopped malware? Now who’s ignorant? If you’d have said it’s not good at blocking malware I would have taken you seriously but with statements like that you obviously have no idea what you are talking about. Just want to thank you, Scott, for this information. My Malwayrebytes upgraded without a problem. Wouldn’t have know about the upgrade if it wasn’t for you. I have been a fan of malwarebytes BUT having recently tried to upgrade to version 3 from their website, there is a big problem. I have had to uninstall it as it does not work – I am paying for 3 installations which I cannot at present use. Having followed their instructions I have uninstalled older version, installed version 3 – which appears to be successful – I run a full scan and get the ‘awesome’ message then close the tab. THEN the next time I try to open up malwarebytes to run a scan, I get an error message saying programme could not be opened. I have reinstalled several times and the same problem occurs. I have emailed malwarebytes, several times but have not had a Tech get back to me once in over 10 days now. Has anyone else had this problem?